This photo was taken on July 2, 2013 at 9:25 am. The location was in Tyson's Corner Virginia at the entrance to a great hotel. The "Take it!" came as I walked out of the hotel on the way back to my car. 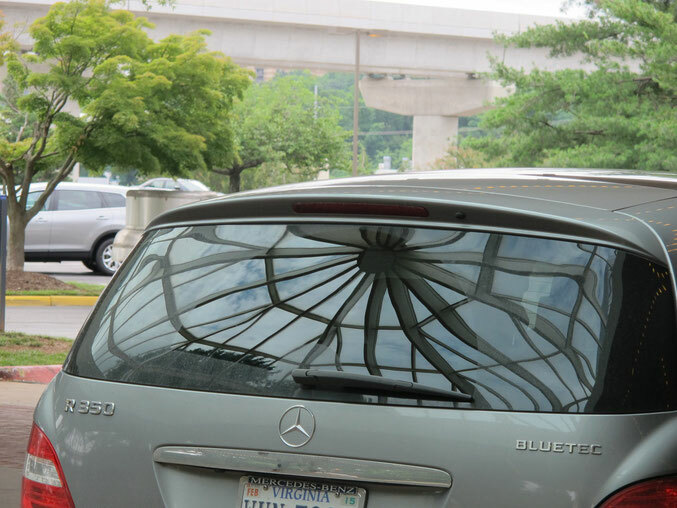 The car from which the reflection comes was parked in front of me and was under the glass topped atrium. The image was just too cool to not capture as the curvature in the glass of the rear window in the car turns the image into one filled with great distortions. The image was not available on my way in - and seen only on my way out because of my alternate positioning. The After Take: To those that i showed this too - all agreed that they liked it. Most saw it as a giant spider but most just liked it for how unusual the image showed up on this common surface. Here is hoping you also have an occasion to see things just a little differently by taking a little different path. Looks like a giant spider is about to attack! I would love to get the cool air from that fan!